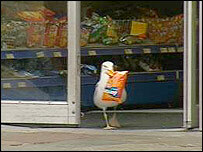 A seagull has turned shoplifter by wandering into a shop and helping itself to crisps. The bird walks into the RS McColl newsagents in Aberdeen when the door is open and makes off with cheese Doritos. 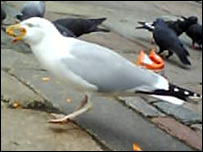 The seagull, nicknamed Sam, has now become so popular that locals have started paying for his crisps. Shop assistant Sriaram Nagarajan said: "Everyone is amazed by the seagull. For some reason he only takes that one particular kind of crisps." The bird first swooped in Aberdeen's Castlegate earlier this month and made off with the 55p crisps, and is now a regular. Once outside, the crisps are ripped open and the seagull is joined by other birds. Mr Nagarajan said: "He's got it down to a fine art. He waits until there are no customers around and I'm standing behind the till, then he raids the place. "At first I didn't believe a seagull was capable of stealing crisps. But I saw it with my own eyes and I was surprised. He's very good at it. "He's becoming a bit of a celebrity. Seagulls are usually not that popular but Sam is a star because he's so funny." A spokesman for RSPB Scotland said: "I've never heard of anything like this before. "Perhaps it tried some crisps in a shiny packet in the street, and was just opportunistic one day at the shop when it saw what was inside. "As everyone knows, gulls can be very quick and fearless, and clearly this one is no exception." He added: "We'd discourage people from feeding gulls though, as gulls in towns generate lots of complaints every year, and the availability of food is the only reason they live in urban settings."